Mickey and the Roadster Racers is about the Sensational Six (Mickey, Minnie, Goofy, Donald, Daisy, and Pluto), as they race around Hot Dog Hills and around the world. Mickey and the Roadster Racers Season 2 Episode 18 Super-Charged: The Big Cheesy; Shenannygans! Mickey and the Roadster Racers Season 2 Episode 16 – Snow-Go With the Flow / Happy Helpers on Ice! Mickey and the Roadster Racers Season 2 Episode 15 – Stop That Heist! / Lights, Camera, HELP! Mickey and the Roadster Racers Season 2 Episode 13 – Pluto and the Pup / Trouble at Floochi’s! Mickey and the Roadster Racers Episode 23 – Happy Hot Diggity Dog Holiday! / Happy Holiday Helpers! Mickey and the Roadster Racers Episode 19 – Ready, Get Pet… Go Pluto! / Figaro’s New Friend! Mickey and the Roadster Racers Episode 16 – Stop That Heist! / Lights, Camera, HELP! Mickey and the Roadster Racers Episode 13 – Smarty Goof / Adventures in Buddysitting! 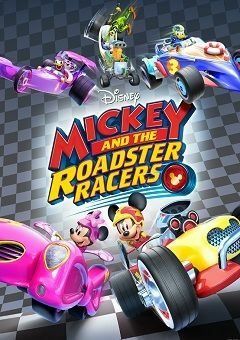 Mickey and the Roadster Racers Episode 12 – The Impossible Race / The Happiest Helpers Cruise! Mickey and the Roadster Racers Episode 10 – Going Upppppppppp! / Gone Fishin’! Mickey and the Roadster Racers Episode 9 Guru Goofy / Bed, Breakfast and Bungled! Mickey and the Roadster Racers Episode 8 Abra-ka-Goof! / Happy Birthday Helpers! Mickey and the Roadster Racers Episode 7 Ye Olde Royal Heist / Tea Time Trouble! Mickey and the Roadster Racers Episode 6 It’s Wiki Wiki Time / Happy Hula Helpers! Mickey and the Roadster Racers Episode 5 Mickey’s Perfecto Day! / Running of the Roadsters! Mickey and the Roadster Racers Episode 4 Agent Double-O-Goof / Egg-xasperating!